A NASA satellite designed to precisely measure changes in Earth’s ice sheets, glaciers, sea ice and vegetation was launched into polar orbit from California early Saturday. 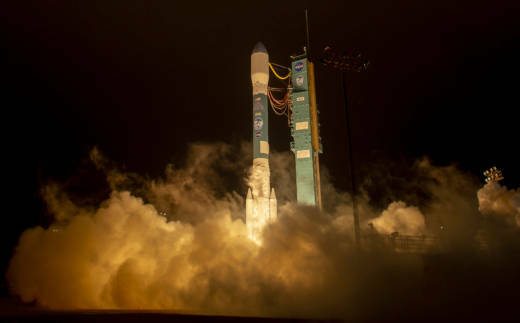 A Delta 2 rocket carrying ICESat-2 lifted off from Vandenberg Air Force Base at 6:02 a.m. and headed over the Pacific Ocean. NASA Earth Science Division director Michael Freilich says that the mission in particular will advance knowledge of how the ice sheets of Greenland and Antarctica contribute to sea level rise. The mission is a successor to the original Ice, Cloud and Land Elevation Satellite that operated from 2003 to 2009. Measurements continued since then with airborne instruments in NASA’s Operation IceBridge. Built by Northrop Grumman, ICESat-2 carries a single instrument, a laser altimeter that measures height by determining how long it takes photons to travel from the spacecraft to Earth and back. According to NASA, it will collect more than 250 times as many measurements as the first ICESat. In addition to ice, the satellite’s other measurements, such as the tops of trees, snow and river heights, may help with research into the amount of carbon stored in forests, flood and drought planning and wildfire behavior, among other uses.